An award-winning Iranian architect has designed and built a seven-story building with three revolving bedrooms in the capital, Tehran. 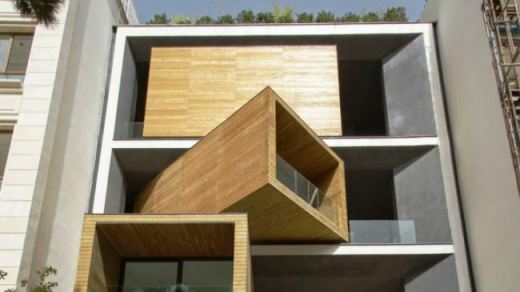 The house designed by contemporary Iranian architect Alireza Taghaboni is located in upscale north Tehran and includes rotating levels. The three revolving bedrooms of the house allow its residents to always enjoy the sun and the best views over the city. In order to change the view from the windows and enjoy the mid-afternoon sun, all you need to do is to push a button. Alternatively, the windows can tuck into the structure to provide a closed, more private environment. “Our design scenario was based on seasons. In winter, when balconies are not usually used, and the outside view is not very important, the structure gets closed, and all attention is shifted towards the void inside the house. In summer, the cubes are extended outwards, and balconies are activated. Now all attention is towards the outside,” Taghaboni said. Privacy has always been a top priority for the Iranians and this was taken seriously in the design of the rotating home. Instead of providing large widows, a void or empty space has been used in the middle of the building to allow sunlight into the house. The void also resembles ancient Iranian architecture. “Our main reference for this project is ancient Iranian buildings, but with a complete revision based on a reading of our own, which obviously uses a modern design language,” Taghaboni said. Around three million euros (USD 4 million) was spent on designing and building the house. Taghaboni says only one seventh of the money was used for building the rotating boxes. The revolving home has been nominated for an international prize at an event called the World Architecture Festival which is to be held in Singapore in October, 2014.